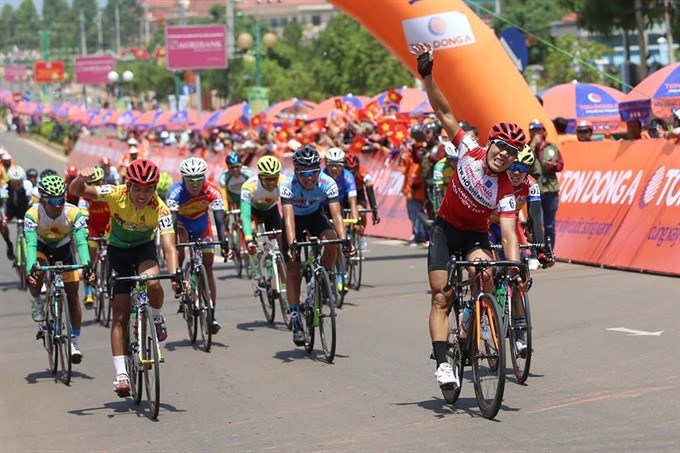 HÀ NỘI — Trương Nguyễn Thanh Nhân won in the third stage of the HCM City Television Cycling Tournament yesterday. The veteran VUS-HCM City cyclist finished the 122km race from Bình Phước Province’s Đồng Xoài Town to Đắk Nông Province’s Gia Nghĩa Town in 3hr 10.33min. Trần Nguyễn Minh Trí of Domesco Đồng Tháp came second, and Nguyễn Anh Khoa of BTV Đại Nam Bình Dương was third. The win has helped Nhân lead the green jersey race with 16 points, beating Monday’s winner Trần Nguyễn Duy Nhân of Military Zone 7, who has 15 points, to the top spot. Finishing in the first group, Nguyễn Dương Hồ Vũ of HCM City’s youth squad stole the yellow jersey from Duy Nhân. He has taken 5:56.24 for three stages. Giang Thanh Tuấn of Army Crew was second, while Nguyễn Hoàng Thái of Calustos Đồng Tháp followed close behind. Vũ is leading the race for the white jersey, given to the best young rider. In team ranking, BTV Đại Nam Bình Dương, not a title favourite, have left the powerhouses behind to reach the first position with a total time of 17:50.56. Military Zone 7 are second, followed by Bikelife Đồng Nai.